Scrub beet roots well, wrap in parchment paper and then foil and roast on a foil lined baking sheet at 375 degrees for 45-60 min or until tender (test by piercing with a knife). While the beets are roasting, press or mince the garlic and set aside. Then, zest the orange and squeeze the juice into a medium bowl. Add the zest to the juice, along with the reminder of ingredients: garlic, black pepper, salt, vinegar, syrup and mustard. Dice the mandarin orange segment and stir them in. Once beets are cool enough to handle, skin should easily rub off. Then, dice roasted beets into small pieces and add to orange and dressing mixture. This will keep well in the refrigerator for a week. Add more apple cider vinegar and/or mustard to taste. As soon as you get fresh beets home, be sure to cut the leaves off, right at the top of the beet root, and store them in a separate bag. That way, the leaves will not pull moisture away from the beets while they are waiting for you in the refrigerator! 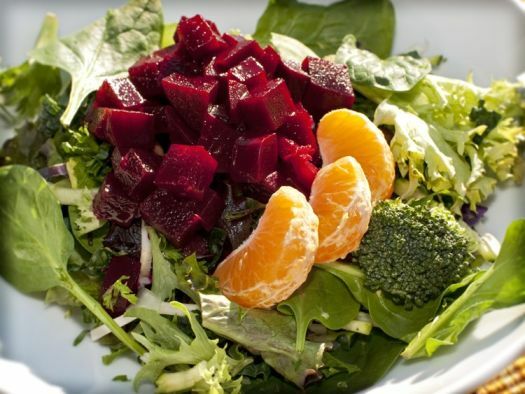 Thoroughly rinse any sand or debris from beet greens, dry in salad spinner or on a paper towel. Chop the most tender leaves into shreds to add to salad greens, and/or chop any of the larger leaves to sauté with garlic and onion, for a separate dish. When you press/mince the garlic and let it sit for serval minutes before adding it to the orange juice, the cancer-fighting compounds develop! Be sure to zest the orange before slicing it in half to squeeze it for juice.